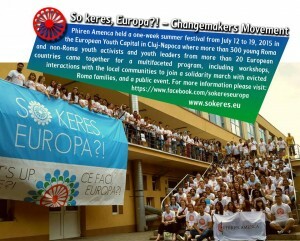 The Roma Social Forum on Volunteering was part of the event called “So keres, Europa? !” (What’s up Europe?!) 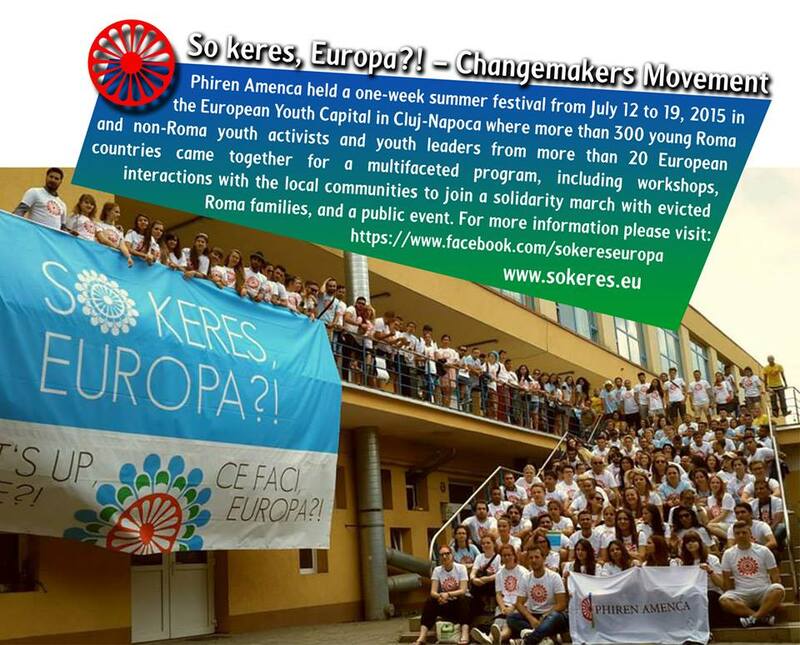 – Phiren Amenca Changemakers Movement, which bring together 400 Roma and non-Roma young people from all over Europe to the European Youth Capital Cluj-Napoca, Romania between 12th to 19th of July 2015 to raise their voice against racism and discrimination towards Roma people in Europe. 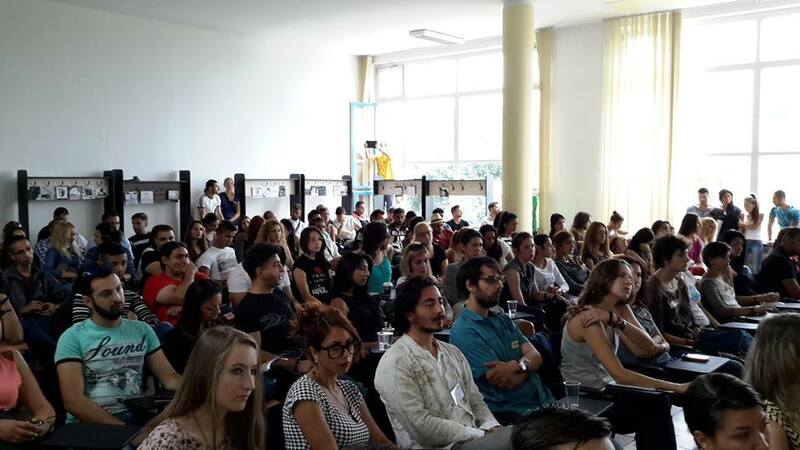 Thematic workshops and special activities took place, where participants had a chance to learn more about the situation of Roma in Europe, to learn and discuss about human rights, antigypsyism, as well as empowerment and activist strategies. During the event from the fourth day participants started their 48 hours actions, which were the core elements of the whole event-week. The topic of the actions were like Roma super heroes, school segregation, challenging stereotypes and racism through music, theatre, rythm, graffiti or media, used art to raise awareness about the Roma Genocide or about our basic Human Rights. As part of the 48 hours actions we also aimed to advocate for the recognition of volunteering and to empower participants and citizens to frame the agenda and impact the European debate on Roma inclusion. On the fourth day afternoon of “So keres, Europa? 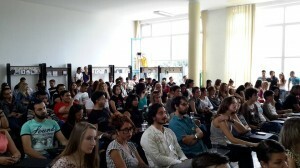 !” we organized a large scale event – Roma Social Forum on Volunteering – with 150 Roma and non-Roma former and current volunteers, organisations and institutions. 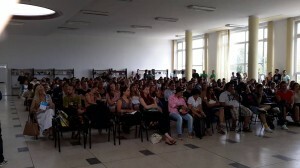 The Forum and the whole “So keres, Europa” event was organized together with the Phiren Amenca Platform of Former Volunteers. The volunteer platform is a project for former and current volunteers who want to actively engage and exchange experience and knowledge after or during a voluntary service; and who want to strengthen the voice of volunteers in the organization of volunteerism and achieve an active engagement in the mission of Phiren Amenca. The Platform is an open space for the development of projects and exchange that are initiated by its members. During the Forum we wanted to follow up on issues and questions we tackled on the 1st European conference on Volunteering for Roma Inclusion in March in Brussels, to discuss further how can voluntary service be a good tool for Roma youth participation, what are the barriers for young Roma people to be part of European Mobility Programs, what is the motivation for the Roma youth and for Roma youth organizations to fight against antigypsyism. In this Forum we had a specific focus also on local volunteering, on the work of local organisations and on the motivation of young Roma people to become active citizens. During this event in Cluj-Napoca, we conducted the quantitative part of our research, a survey which aimed at understanding the situation of young Roma. Specifically, we wanted to learn about existing engagement and participation, and opportunities of non-formal education, but also the barriers young Roma face when it comes to participation, specifically also to volunteering and voluntary service, and how antigypsyism influences their lives. The evaluation of the survey questionnaires was later followed by qualitative interviews with young people (Roma and non-Roma) and NGOs (international networks and grassroots organizations) and the Research on Volunteering – Citizens’ tools for Roma participation was published in March 2016.